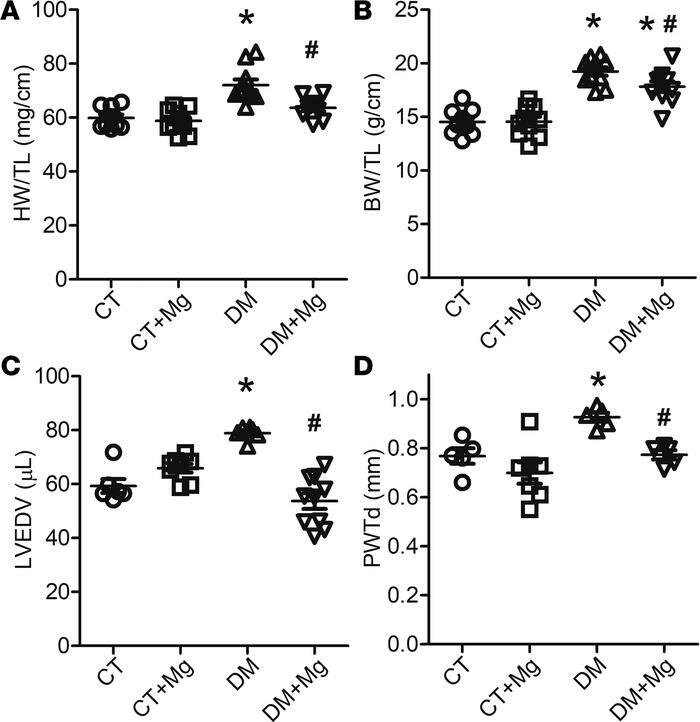 Dietary Mg mitigated cardiac hypertrophic changes in DM mice. (A) Heart weight/tibia length (HW/TL). Ten animals were tested for each group. (B) Body weight/tibia length (BW/TL). Ten animals were tested for each group. (C) Left ventricular end diastolic volume (LVEDV). Six to 10 animals were tested for each group. (D) LV diastolic posterior wall thickness (PWTd). Five to 7 animals were tested for each group. One-way ANOVA with Bonferroni post hoc test and 2-tailed Student’s t test were used; *P < 0.01 vs. control, #P < 0.05 vs. DM. CT, control mice; CT+Mg, control mice fed with normal chow and Mg in drinking water; DM, mice fed with high-fat diet; DM+Mg, mice fed with high-fat diet and Mg in drinking water.